It's time to rewild the child! 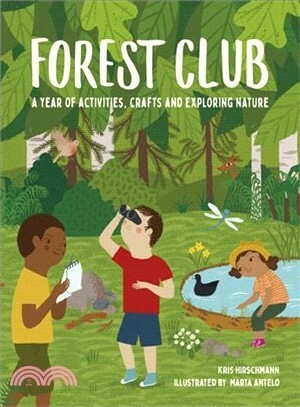 This book of outdoor activities, crafts, nature information, and inspiration ties into the burgeoning interest in forest schools and "rewilding the child," with the aim of reconnecting children to nature and the outdoors. The book is divided by season, providing a year-round resource for families. While all crafts and activities are designed to be carried out outside, these are interspersed with factual pages about forest flora and fauna, which can be enjoyed at home or used as a field guide while out and about. A beautifully illustrated and informative title to spark children’s imagination and free-thinking. With forest school-themed crafts and activities for all seasons, outdoor exploration can be enjoyed twelve months of the year, always with something new to see. After working for a decade as a magazine and book editor, Kris Hirschmann embarked on a 20-year freelance career writing books for children and young adults. She is constantly inspired by her own children, who let her see the world through a child’s eyes every day. She lives just outside Orlando, Florida. Marta Anteloa?? graduated with a fine arts degree in Valencia, where she was born. After graduation, she moved to Madrid, where she works as a freelance illustrator. She brings delicate textures to her illustrations. Her client list includes: The New York Times, The Boston Globe, Wall Street Journal, National Geographic Kids, and Scholastic.